Keeping customers happy is what makes businesses click and the automotive industry is no different. In fact, with vehicle purchase having a high emotional quotient, customer expectations are always high and OEMs have to ensure that their aftersales operations, which also handle vehicle repair, win over customers and influence positive word of mouth, so critical in a market like India. 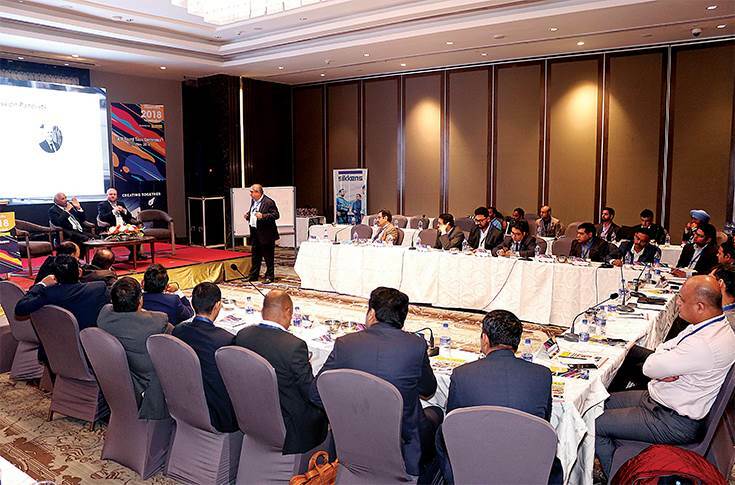 To discuss and debate this issue, the ongoing development of the Indian collision repair market and the scope of improvement, a number of high-ranking executives and industry experts from the aftersales division of key vehicle OEMs came together in New Delhi on November 20 for the ‘2018 OEM Roundtable Conference’ led by RepairTalks, an automotive knowledge and education start-up, and hosted by industrial paint specialist AkzoNobel. Autocar Professional was the official media partner for the day-long event. 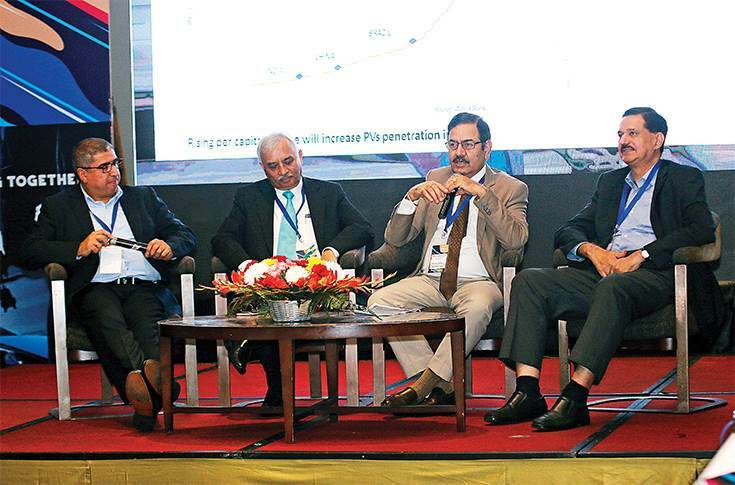 The meeting saw industry professionals bring to the table the many vexing issues and concerns impacting passenger vehicle (PV) aftersales in India and brainstorming to find solutions to some, if not all, of them. The panellists included Dinesh Bhasin, former VP (Service and Customer Care and IB), Tata Motors; Arun Malhotra, former MD, Nissan India; Sanjeev Agarwal, VP (Service), Nissan India; Joseph Alexis, head – Aftersales, Audi India; RK Duggal, head – Maruti Suzuki Service Division; Pankaj Narula, senior advisor for Customer Quality Assurance and Service, Suzuki Japan and executive advisor, Maruti Suzuki India; Kevin Jones, former head of Al Futtaim Motors; Keith Malik, director of global accounts, AkzoNobel; Graham Threlfall, global key account manager, AkzoNobel and Shelley Cheshire, CEO of RepairTalks. Over 75 industry professionals attended the roundtable, debating and sharing knowledge to drive gains in the Indian automobile market. Compared to developed markets where motoring is well entrenched and a fair number of vehicle owners indulge in do-it-yourself operations for regular maintenance and small repairs, Indian market studies indicate that 83 percent of PV customers prefer visiting authorised service centres for general maintenance as well as major accidental repairs. However, small tinkering jobs are still preferred at local garages which end up being cheaper. The forum also spoke about the emerging megatrends wherein up to 2050, industry strives to offer sustainable mobility solutions, which will help stem and then improve the degrading air quality around the world, eventually targeting full vehicle electrification and bringing a paradigm shift to the century-old automotive ecosystem. Vehicle autonomy and IoT are the given technological add-ons, which will further accelerate the drive towards the new future. L-R: Keith Malik, director, Global Accounts, AkzoNobel; Pankaj Narula, senior advisor, Customer Assurance and Service, Suzuki Japan, and executive advisor, Maruti Suzuki India; Dinesh Bhasin, former VP (Service & Customer Care), Tata Motors; Arun Malhotra, former MD, Nissan India, in the session on maintaining business sustainability in disruptive times. “Different markets have approached the problem of pollution and congestion in a different way. For instance, in China only green registration-plated EVs are allowed to venture into specific areas plagued by air pollution,” said Keith Malik, director, Global Accounts, AkzoNobel. On the vehicle repair front, the panellists were of the consensus that the country should have stringent guidelines and standards to ensure qualitative vehicle repair (for the consumer), while also ensuring a safe work environment. “We do need the government and the authorities to chip in and formalise standards which the industry proposes so that there is a mutual consensus and no conflict of interest. This will enable effective implementation of regulations on the aftersales front and bring authorised as well as neighbourhood garages on the same level of repair quality,” said Pankaj Narula, senior advisor, Customer Assurance and Service, Suzuki Japan and executive advisor, Maruti Suzuki India. “Even in case of repair at the unorganised level, it is the OEM which needs to take care and ensure a proper repair job and by training the people, in order to protect the brand from taking a hit from any substandard work causing a mishap and thus impacting the brand negatively,” said Narula. Shelley Cheshire, CEO of RepairTalks: "The global automotive industry is undergoing significant transformation. Electrification, autonomous and IoT are the key disrupters." Market maturity in different countries depends upon customer awareness and regulatory standards. India Auto Inc is actively working to gradually increase the level of workmen skills as well as the quality of the spare parts at workshops to offer a high quality repair job, especially on the bodyshop front. 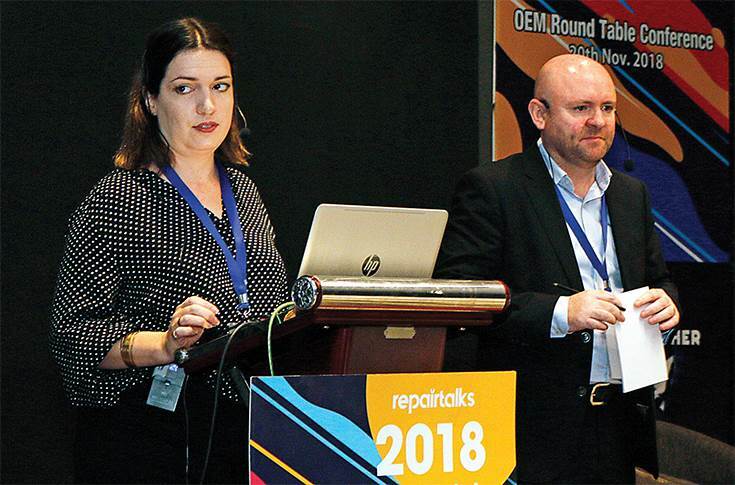 “Authorised automotive dealers, as well as the local garages, need to outsource training and source their parts from the OEMs, so as to not fall into the trap of spurious parts from the grey market and the lack of expertise of unskilled manpower,” said Graham Threlfall, global key account manager, AkzoNobel. “Dealer profit on vehicle repair stands in the range of 15-20 percent on replacement body parts and hence, if a car goes to the unorganised sector for repair, the replacement part doesn't come sourced through the OEM channel, thus being a huge lost opportunity,” added Keith Malik. On the other hand, the gross profitability on labour cost of such repairs stands at a tremendous 65 percent, given the low labour rates prevalent in India. The average profit on selling of body paint tops at 70 percent, when seen as standalone and not consolidated with the labour charge of its application. Of the total invoice value, however, labour charge takes the top spot with 47 percent of the total contribution, with parts coming second at 43 percent and paint only contributing to 10 percent of the total bill of a repair. “When we do not use the right methods to make profits, then it is called profiteering. Every business needs to make profit and as a result we need to optimise the processes to maximise profits, but at a reasonable expense to the customer,” said Pankaj Narula. Hyundai Motor India's S Punnaivanam: "We offer sustainable solutions like dry washing and encourage our dealers to use the water-borne re-paint process." The panellists also analysed trends in mature markets globally where OEMs sell critical body repair parts such as chassis and body panels only to dealers, as well as independent garages which can prove their mettle by being able to perform a proper repair job, thus ensuring a high level of customer satisfaction. With the motor insurance business being majorly handled by nationalised companies in India, the panel saw consensus on the hassles in document retrieval. As a result, the insurer remains open to inconsistent estimating standards. The end result is the threat to customer retention, both to dealerships as well as insurance companies. PSU insurance companies have been at the receiving end of dealer malpractices in the past and, as a result, have become cautious of passing claims easily. Now, as each insurance company has a tie-up with OEMs, they are working on fixed pricing based on benchmarking within the industry. Child part assemblies also impact cost to the customer as well as to the insurance company and no OEM allows for a difference in quality if the labour is contractual or on the dealer's payroll. The end result should be the same. The panellists discussed the need for an automated estimation system, which should take into account labour cost as well as material and component costs, to offer insurance approvals in real time. Computerised systems will go a long way to ensure transparency, they averred. All the panellists voted in favour of the universal truth – 'Customer is King’ – be it repair at authorised workshops or independent garages. 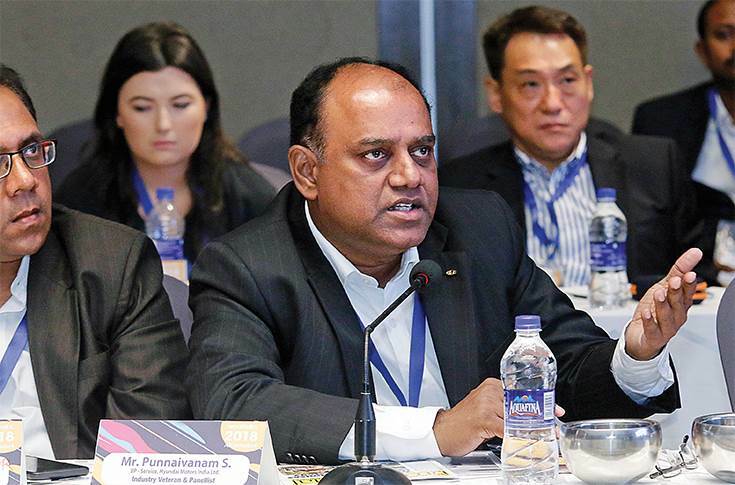 Detailing the initiatives taken at Hyundai, S Punnaivanam cited the examples of workshop automation including introduction of digital job cards at its service centres, along with starting the concept of overnight service for fleet operators at 45 of its authorised service centres, where cab drivers running Hyundai cars can Ieave their vehicles to be serviced between 7pm and 9am. Moreover, while it takes first-time car owners for a workshop tour every weekend, it has also devoted service bays and experienced manpower for customers of its premium models who have more expectations. Hyundai is also seeing its doorstep service program picking up steam, with 450 motorcycle-borne technicians handling minor repair jobs around the country. “Expectations are different for different customers and can vary between quality, cost, convenience and time,” pointed out Punnaivanam. The roundtable concluded with the thought that if businesses need to ensure profitability, it is imperative they adapt to change and drive towards a sustainable future by deploying modern processes and, importantly, winning the customer's trust every inch of the way.